A good neutral eyeshadow might seem boring to some, but I can have a million different browns and taupes and still want more. If I had to pick favorites, though, warm-toned browns would take up all the space on the list. 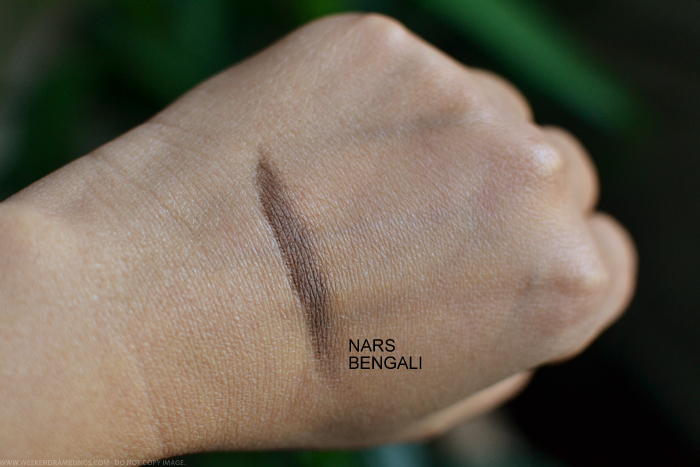 NARS Bengali is one such eyeshadow. 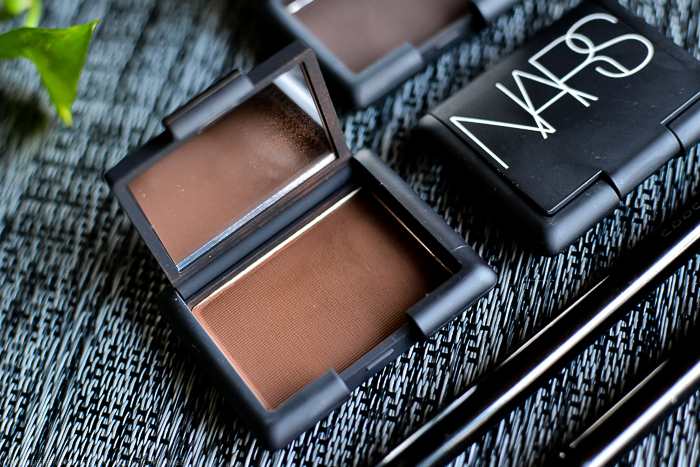 It's described as a rich chocolate brown, and is one of the NARS single matte eyeshadows. I have had disappointing experiences with some NARS eyeshadows in the past, but this one is a definite winner. Scroll on for more on this fabulous eyeshadow. The color can look a bit different depending on the lighting (even natural lighting depending on the time of the day), and this is about as neutral lighting as I could manage. 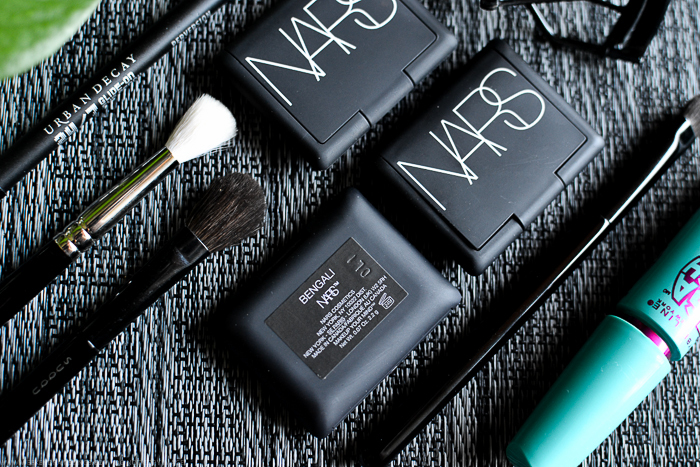 Like almost all NARS powder products, this eyeshadow too comes packaged in sleek matte NARS packaging. The eyeshadow singles come in really small compacts and include a mirror inside (see photo above). A lot of people complain about this packaging getting supermessy, but I guess I have been lucky with mine. I find it easy enough to wipe clean with a soft cloth. 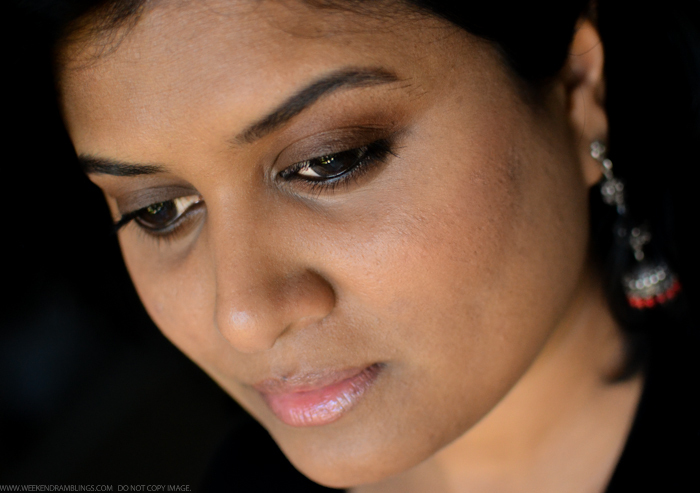 On my darker skin, this shows up as a deep brown, and the warm tones in it might not be very obvious, especially when I apply a thick swipe of the shadow. It does show up better when the shadow sheers out with blending. Wearing NARS Bengali eyeshadow all over my lids. One reason I am partial to warm-toned browns is they do a good job at neutralizing the darkness of my eyelids. I suppose I could use a concealer or Paint Pot kind of color-correcting product first and then apply my eyeshadows, but lesser products equals lesser creasing and longer wear time on my lids. Anyhow, my current favorite way of using NARS Bengali: Start with a sheer wash of NARS Persia along the crease, Bengali all over lids, and Coconut Grove along outer corner just to add a teeny bit of definition. Finish with black liner to tightline/along waterline and a black mascara on curled lashes. 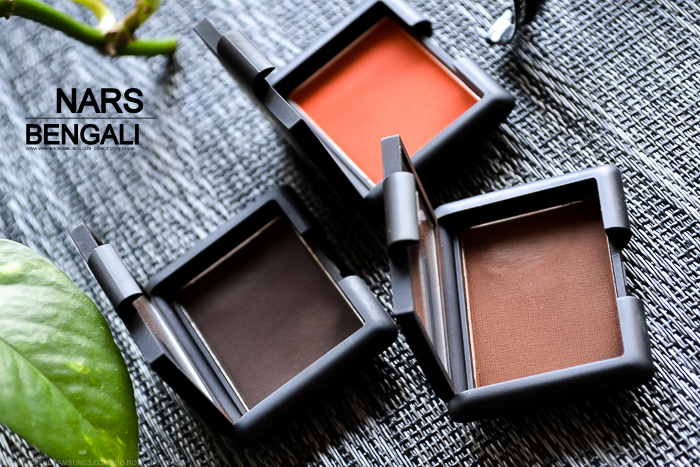 NARS Bengali is a richly pigmented, buttery soft eyeshadow that is relatively easy to blend. I use it as an all-over-the lid color or sometimes as a crease color, but on lighter eyelids, this should also work great along the lashes as a liner (won't show up that well along my lashline at least). Over a primer, this lasts the whole day long - without a primer too, if it isn't too humid or hot outside. Do give this one a try the next time you are at a NARS counter. It's easy to miss among newer and flashier colors, but this is the sort of classic neutral you can depend on any time of the year. Links provided in the post are for information only and are NOT affiliate links.